This is the first time I am honouring two mappers - but not for working together. Revned has fully mapped the six Mega Man games on the NES - and though his maps were certainly more than adequate, he went back and remapped all of them. That's mega-dedication! Rick Bruns of nesmaps.com has also mapped this game, opting to show the placement of enemies. Either way, they've totally mapped this classic from the 8-bit era - isn't it about time we enjoy some more Mega Man? 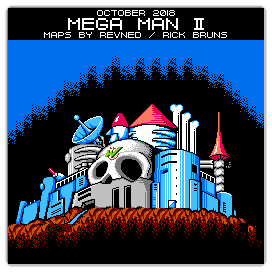 Also, it would have been confusing to have it look like "Mega Man 11" was featured for the Maps Of The Month beginning October 1, since the game comes out October 2.